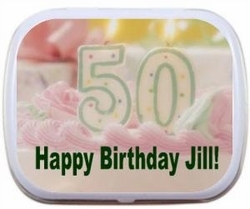 Personalized Birthday Cake Mint Tins make a great Birthday Party Favor! Complete with age, choice of mints and any wording you like! Our Personalized Mint tins are a lovely and unique way to remind your guests of the fabulous time they had at your birthday Party! This pretty Birthday Cake design can be personalized with the number birthday that you are celebrating plus one line of text. Our designers did a wonderful job creating this tin to be pink and perfect for any age! Choose your favorite candy choice and mint tin color.